It’s time to get to higher ground with these aerial lifts. Whether it’s washing windows or rescuing lives from buildings, these lifts are commonly used for a variety of occasions. Aerial devices can be controlled to extend the lift in several different directions, which can often include “up and over” applications. 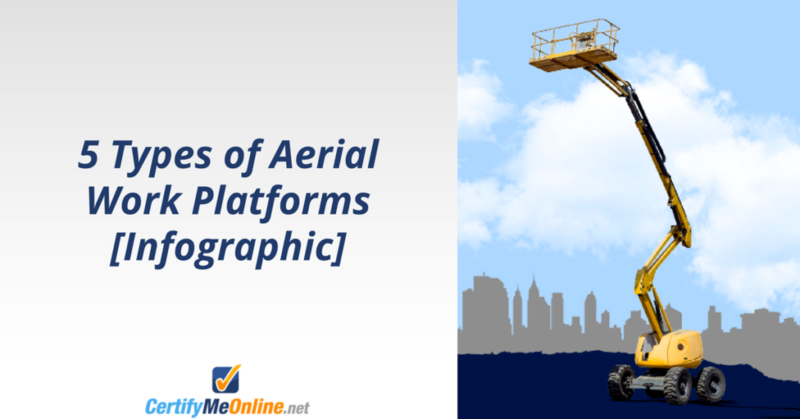 However, there are a few types of aerial lifts that are designed to perform different tasks. The boom lift, aka The Spider, is often set up outside a building and resembles a spider with 4 legs. The lift resembles a cherry picker. Originally designed for orchards, it allows the individual to pick high up fruits with ease. Nowadays, it is frequently used for construction and to maintain overhead line, spruce up tall trees and even assist firefighters in areas that are difficult to access. The spider lift has a bucket at the end of the boom where workers stand to access the work area. Since it is mounted on a vehicle, it comes with durable tires and can be driven on uneven terrain. An articulated boom lift, also known as a knuckle lift, has a work platform on an extended arm that can reach up and over obstacles, resembling your finger when you bend it. Articulated boom lifts have a turntable at the base which allows the lift to swivel in a full circle. This type of machine is used mainly for maintenance work and other tasks that are difficult to access. Unlike a scissor lift which can only extend directly above itself, articulated boom lifts are types of aerial lifts that can be used for repair jobs on the exterior of buildings, including piping. They provide convenience for hard-to-reach areas and can be used on uneven terrain. This type of aerial lift is used for tasks that require maximum reach capabilities. A work platform is mounted on a straight, long arm that sits on a movable turntable. Telescopic boom lifts are not like articulated boom lifts that can bend and curve over obstacles; telescopic lifts are types of aerial lifts that can only access areas that are straight above or at a direct angle. Electrical repair, window washing, and other maintenance jobs are the most common that employ the assistance of a telescopic boom lift. One of the most preferred lifts, scissor lifts are a type of platform that can typically only move vertically. According to Wikipedia, the upward motion is achieved by the application of pressure to the outside of the lowest set of supports, elongating the crossing pattern, and propelling the work platform vertically. The platform may also have an extending “bridge” to allow closer access to the work area, because of the inherent limits of vertical-only movement. Scissor lifts are much more limited in use compared to the other types of aerial lifts including articulated and telescopic boom lifts because they have to be situated directly underneath itself. They also cannot reach maximum heights. Therefore, they are best for indoor use like basic maintenance work and painting since the larger-sized bucket can accommodate multiple workers and equipment. There are rough terrain scissor lifts available to handle slightly uneven terrain when outdoor work is required. Resembling the cherry picker, the aerial lift is often a popular choice for getting to higher ground. According to OSHA, Aerial lifts are vehicle-mounted, boom-supported aerial platforms. These lifts are used to access utility lines and other above ground job sites. While aerial lifts can be a blanket term used to describe boom lifts and scissor lifts, the original design of an aerial lift was used to drive to outdoor job sites to access electrical lines, trees, and more. Aerial lifts are usually controlled by the operator on the platform. Safety is also a huge priority with these lifts. OSHA states that the major causes of fatalities are falls, electrocutions, collapses, or tip overs. Employers must take measures to ensure the safe use of aerial lifts by their workers if they are required to use this equipment. Operators must take their lives into their own hands and be aware of their surroundings at all times, especially when working near electrical power lines that may be live. Safety products like lanyards that attach to the bucket as well as hard hats and rubber clothing are needed for utmost safety on the job. If you’re an aerial lift worker, and you still need to complete your aerial lift certification, check out CertifyMeOnline.net. On our website, you can read more about the various types of aerial lifts, the dangers involved with operating, and how you can avoid hazards that lead to serious accidents. This entry was posted in Aerial Lift Training on October 7, 2013 by admin.